First of all, let’s not ignore the consistency in some of those numbers. The exact same number of completions through ten games in two years? The same number of touchdowns and interceptions through ten games in both 2017 and 2015? Wow. One big change is in the yardage: 300 more yards than last year. As a result, the YPC and YPA numbers have seen huge jumps. Last year, Baker finished the season with an 11.08 YPA line; that number was good for second all time (Michael Vick holds the record from 1999 at 11.35). His 11.90 would be a huge jump from that. 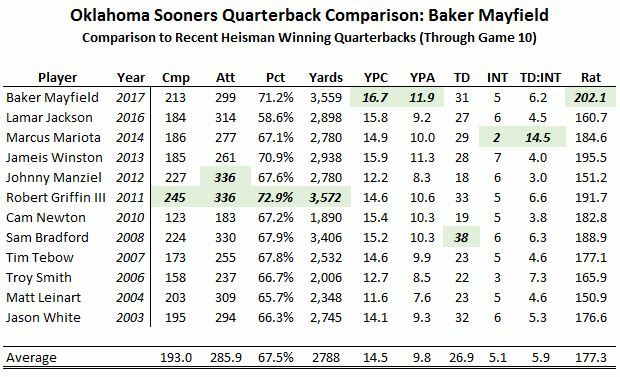 There have only been three seasons with a YPA number over 11.0 – Baker could have two of the potential four if he finishes above that mark. Finally, the passer rating. 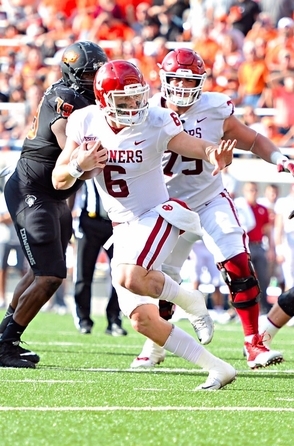 Last year, Mayfield broke the single season passing efficiency rating by almost five points; he’s beating that mark by almost six points this year. That would be a truly remarkable finish.